Rubicon's Great Little War Game is an excellent turn-based strategy game for Android and costs a decent $2.99 to buy for such an excellent game which makes you go "just one more turn" every time you play it before you go to work or before you go to sleep. I have to admit, I absolutely love this game even though I am not a fan of turn-based strategy games - I would say this is the exception case of all. The graphics are great with lots of units, plenty of humour to go around with units saying "you're gonna...miss...me" when killed and the maps are pretty well thought out. 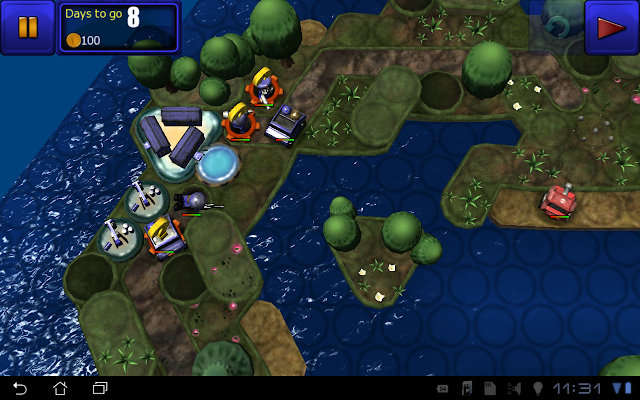 You do get a variety of units ranging from your typical ground marine units, tanks, sea units and even bombers. Full review after the jump. Great Little War Game has 3 modes - a campaign which contains 20 of the standard missions and 10 additional missions dubbed "Call Of Booty" where you help the main character - General Generalissimo to impress his date by taking over a country. 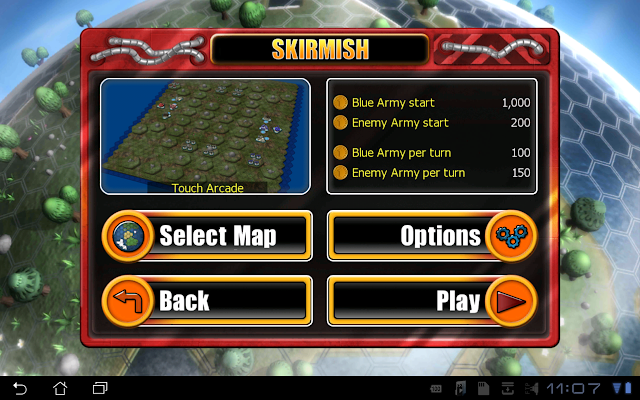 The other two modes are the standard issue skirmish with a decent amount of maps to play with and a "pass and play" mode that allows you to pass your Android device to a friend (or enemy) to battle against. Lets talk about the game missions - you should start off with the standard 20 missions by at least playing 4-5 of them first before tackling the "Call Of Booty" missions which are more difficult to play with. The standard missions are very well thought of as I mentioned earlier, it starts off easily with introducing the basic units of the game without allowing you to "train" or "build" other units until later in the other missions as things progresses. The AI in this game is pretty impressive although you start off with the "easy" difficulty and won't have access to the other level of difficulties until you finish all 20 missions, the AI itself is no slouch and is definitely a formidable opponent to fight against. The main and only resource in this game are the Oil Rigs which you will start with a few of them (in some missions you don't get them and don't get to build anything) and you can capture neutral oil rigs that are around the map or if you're ambitious enough - you can try to capture the enemy's oil rigs. 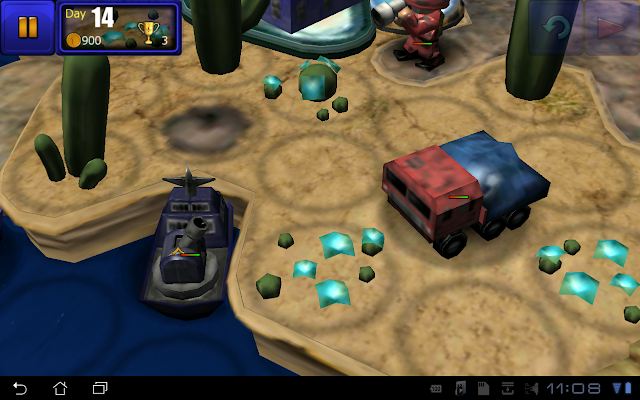 Each turn that you take in this game is a day in the game's time and in the missions, you have a specific set of days (such as 15 days) in order to set the gold standard and if you can't finish the mission in the set number of days, you can still try to go for the silver standard and if you still can't make it, you can go for the bronze standard and the worse case scenario is just "passing" meaning you managed to win the game normally with a lot of turns - so no trophy for you. Naturally the gold standard is the most difficult one to set but it is definitely achievable - all you have to do is go all out to meet the objective. Everything else is not relevant. For example, if the objective is to capture the enemy HQ - you don't have to destroy all the units in the process or capture every other structure to win the game. You just have to find the fastest way to capture the HQ - that's it. There are some missions where you are required to bring the General Generalissimo to safety at the other end of the map which requires proper strategy and planning to achieve. It is these kind of mixture of missions that make the game enjoyable and you'll never have another dull moment or a moment where you have to complete the same set of objectives over and over again with a different setting. Moving on to Skirmish, you get to choose various maps - some require you to capture the production plants before you can produce them - for example you may need to capture an airfield to build air units or vehicle factory to produce land vehicles like tanks and such. In skirmish mode you can also choose how much cash you want to start with and how much each side will earn per turn, either making it easier or more difficult for yourself depending on how you want to play it. Everything else is pretty much the same as campaign mode but you have to eliminate all of their units as well as take over all of their structures to win. There's no gold, silver or bronze standard here so you can take your time to win the game. 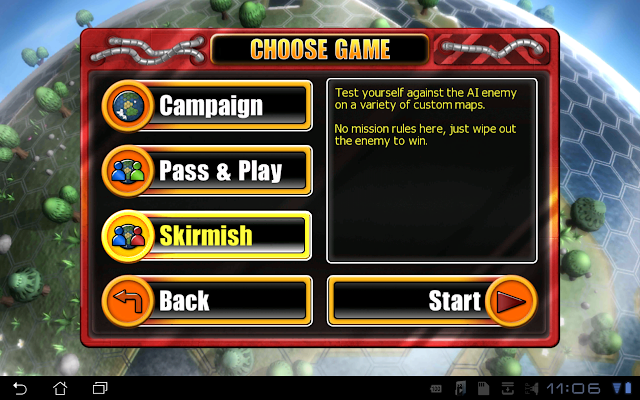 Pass and play mode works just like skirmish but you just pass along your android device to a friend (or enemy) on his or her turn to challenge you in the battlefield of war. Is there anything bad about the game? Yes. I am unhappy about one thing in this game - Tegra 2 performance. As most of you know, I own an ASUS EEE Pad Transformer - a Tegra 2 powered tablet which is at present, the best selling Android tablet. This game plays well on the medium level of detail on most maps except some larger maps especially the final mission (mission number 20) of the standard campaign - it lags pretty badly but it is still playable nonetheless. The developers have been receiving a lot of feedback from me and what they've done is to include a toggle switch in the settings mode to change between "fast" and "best" graphics mode which essentially scales down the game resolution to something around 640x480 in fast mode versus 1280x800 (or whatever the native resolution is on your tablet) for the best graphics mode. 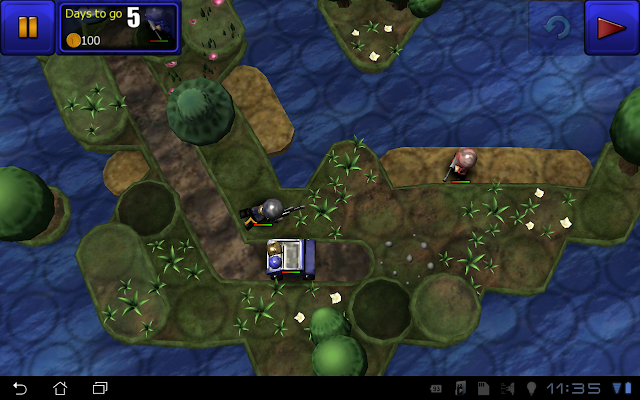 Now, the fast graphics mode makes everything looks extremely ugly on a tablet with a large amount of real estate. Sure the game plays smoothly now but what's the point when the game looks really really ugly? I'd rather take the performance hit on the best graphics and setting it to low or medium and at least I will enjoy the game better. I have suggested to the developers to increase the resolution to 800x600 but I did not get any updates from them on this despite some follow ups. What I'm looking for is the best graphics + performance combo possible. Right now its either very fast on ugly graphics or very slow on nice graphics. Maybe I'm expecting a lot here because you could tweak a lot of this stuff in a traditional FPS or even RTS game. So with my complaints above, should I still recommend you this game? My answer is absolutely YES if you enjoy playing strategy games even if you're not into turn-based strategy games, you should check this out. But if you can't accept the poor performance on Tegra 2 tablets, then you might want to skip this game or if you've already bought it and played it on your Tegra 2 tablet, please complain to the developers so that they at least know it is important to optimize the game for Tegra 2 - its a no-brainer. With that being said, just grab this game - it is worth every single penny you are paying for - it is only $2.99 and despite the performance issues, I still love this game to death. My rating for this game? A solid 4 out of 5 stars. If Rubicon were to optimize it for Tegra 2 tablets, I'd give it a full 5 out of 5 because it deserves it then.